A very Happy New Year to everyone. 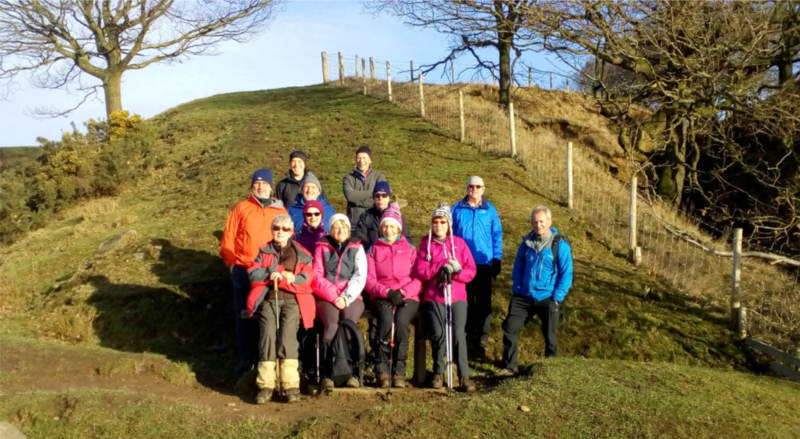 For our first walk of 2019 we met up on Horrobin Lane Rivington on a gloriously sunny morning. 13 of us started from the Bowling Green and headed off down the path towards Yarrow Reservoir. Where the path divides we went left, eventually passing Dean Wood House just before entering the field via the stile. Bearing left we followed the path across the fields with the Reservoir on our left. Arriving at Hodge Brow we went down the road to Alance Bridge. Taking the path straight ahead, we continued on until we came to the signpost for Jepson’s Farm. Turning left we proceeded across the fields to Jepson’s Farm. Passing between some of the farm buildings, we arrived on Moor Road. Following the road, in the direction of Jepson’s Gate, we got to Manor House. Following the sign to Upper Bullough Reservoir we descended to the reservoir. Turning right the path led us back out into farm land. Here we had our coffee break with added benefit of some magnificent views across Anglezarke. As it was a clear day Morecambe Bay could be seen in the distance. Refreshed we resumed our walk towards Boatman’s Cottage. Re-joining Moor Road we passed by the cottage and the end of the reservoir. Starting our return, we followed the lower footpath which runs alongside the reservoir eventually rising to Heapey Fold Lane, continuing on along the track, passing Kay’s Farm, to Back Lane. A short walk along the road to the stile and back on to the path beside the reservoir. Then crossing Knowsley Lane, we headed to and along The Street emerging back onto Horrobin Lane and our cars. After a quick change of footwear we went to the Village Green Tearoom for lunch. The next community walk is: A walk to Worthington Lakes. Tuesday 12th February, starting at Retreat, 19 Church St, Adlington, Chorley PR7 4EX. Gather at 9:45 for a 10 o’clock start. Lunch at Retreat afterwards. Pre-order for food is necessary.